Since the color most associated with Valentine's Day (and my favorite accent color!) is red, it's only fitting to highlight this lovely pair that add just the right amount of statement-making pop to any ensemble. 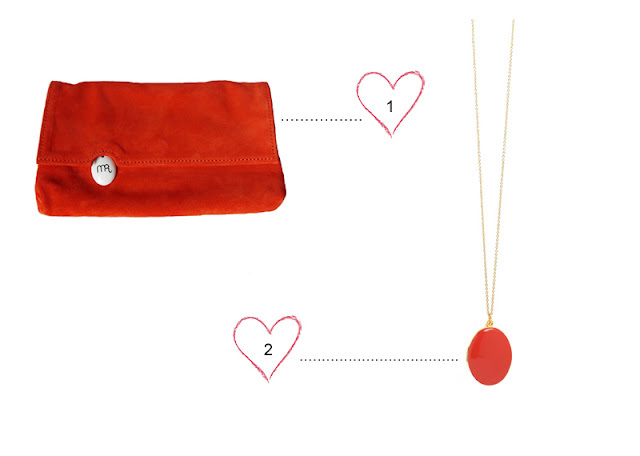 Everyone should have one red leather clutch or bag in their collection. This pochette by Manufacture des rigoles is a beautiful piece that is flexible and portable. Featuring an option for cross body wear, it is great for day time when you're traveling light and transforms to a clutch for a night out. And who can resist this gorgeous Trois Petits Points large enameled locket necklace?A sweet accent for any outfit, especially for Valentine's Day!